Hedychium coronarium is a robust, attractive plant that will reach 6 feet in containers. It is a vigorous grower and needs to be divided often. 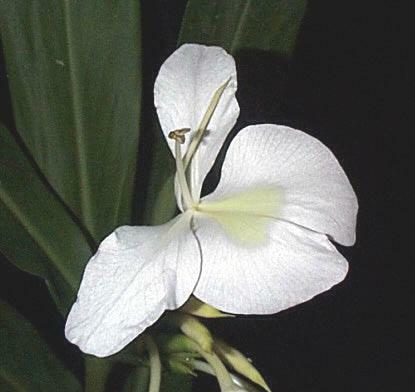 White Ginger is native to tropical Asia. Blooming Time: Summer-Fall. The white flowers are extremely fragrant and are good for cutting. Culture: Hedychium coronarium need light shade and a soil that is high in organic matter. At the greenhouse we use 2 parts peat moss to 2 parts sand to 1 part loam. The plants should stay wet at all times, the pots may even be immersed up to the crown in water. Fertilize weekly with a balanced fertilizer. The plants are very robust and quickly grow out of the containers. They need to be divided yearly. Remove old stems after flowers have faded to promote new growth. The plant tends to get unattractive after blooming because if given enough heat to bloom it will burn. Propagation: Hedychium coronarium is propagated by division in late winter- early spring. Hedychium coronarium was featured as Plant of the Week July 7-13, 2000.